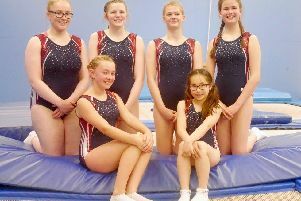 Millie Heathcote and Olivia Webb have shown their class for Orbit Trampoline Club at recent competitions. Competing in both the English Championships and the National League, Millie has fought hard for a place in the English, while Olivia has recorded a 10th and 12th place, which should propel her into the final last 16 which takes place in Sheffield in October. In the first League Millie was 18th. 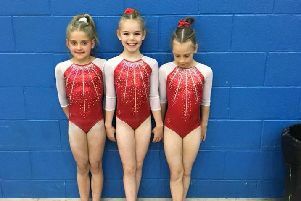 while Olivia was fifth and in their synchronised partnership they were seventh. More recently, last week end in Cardiff, both performers improved their positions to 12th and fourth respectively, and took a fine bronze in their Synchronised event. In the 11-12 girls in her first attempt, Grace Blackmore put herself on the map by scoring a point in 24th place. Her successful sister, Charlotte, was unable to podium this time, but took a creditable sixth place in the girls 15-16s. Rachel Marsh was 21st in the girls 13-14s carrying her training problems with her into the competition. In the boys 13-14s Josh Watters took an improved sixth place. Milly Cole and Rebecca Dormer were 20th and 10th respectively, despite Milly having lead the field in first place after the first routines in the 15-16s. Orbit's other synchronised pair of Milly Cole and Emily RoxbeeCox in the senior girls, were 10th.